MGA has supported airbag deployment testing for decades. In order to further support particular specifications which call out a timing limit on deployments being conditioned, MGA developed an Automated Environmental Airbag Deployment System (AEADS). With a single command, the chamber doors open, the track system removes the test sample from the chamber, and guides it to the specified location. Once the sample is in the deployment position, the test is automatically performed. In-line triggering of high-intensity lights and high-speed video cameras. Time to deployment from the beginning of the automated process is 10 seconds. 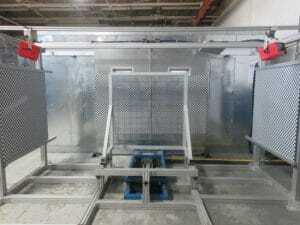 Environmental chamber operating conditions ranging from -40°C to 90°C. Safety interlocks integrated into the system so that the airbag only deploys under pre-set, specified conditions. The AEADS is designed for seats and is currently operational at MGA’s Alabama facility. This newly designed system results in a much more precise system from the perspective of timing, position, and test repeatability. A second generation system that will accommodate instrument panels and partial body-in-white bucks is currently under development. John Gizowski at (248) 670-2936 or john.gizowski@mgaresearch.com.